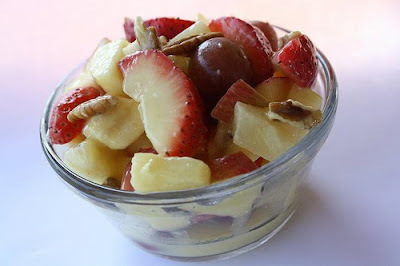 Discription:This is a very simple and quick summer side dish – fruit salad. Fruit salad is very popular and if you go to almost any party or event, you will be sure to find a large bowl of fruit salad. This dish is perfect for those who are looking to make something for a graduation party.The sauce which is a mixture of instant vanilla pudding mix, water and pineapple juice really makes the dish. The only work that’s really involved is dicing all of the fruits. This dish is also very versatile; you could use a lot of different fruits such as blueberries and kiwis. You can also use different types of nuts if you prefer something other than pecans. The process is very simple. Some of the diced fruits are placed in a bowl and then coated with lemon juice. The rest of the fruits and the pecans are added and then coated with the pudding mixture. The salad is then chilled and ready to serve. Enjoy. Step 1: In a large mixing bowl combine apples, bananas and lemon juice. Toss to coat. Add pineapple, strawberries, grapes and pecans. Step 2: In a small bowl whisk vanilla pudding mix with water and reserved pineapple juice until smooth. Step 3: Add pudding mixture to fruit and mix gently until thoroughly coated. Refrigerate until you are ready to serve.